We offer kittens and cats for sale that are not found at the local pet store. 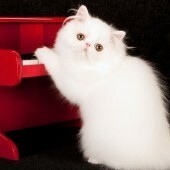 We understand the interest that cat lovers have to own their very own show cat or a special color or maybe a small cat. A Vanier Persian will make an adorable addition to your family. Many people prefer Teacup cats for sale because of their tiny size. With careful breeding, we have made it possible to offer you the finest silver and golden cats and kittens, white cats and kittens, bi-color cats and kittens with the characteristics that you will appreciate. The cats and kittens we offer for sale are the result of many years of selective breeding. They are in high demand and tend to move quickly. The best way to get the cat or kitten of your choice is to fill out the application on line. 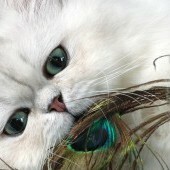 If you have always dreamed of your very own beautiful Vanier Persian Cat or Kitten, we will make your dream come true! Vanier guarantees that you will have a healthy and socialized kitten. First of all, kittens are not randomly bred. The sire’s and dam’s are CFA registered and most of the CFA registered Vanier Persians and their lineage have been to the show hall. Vanier is a registered cattery name with the Cat Fancier’s Association and with it comes an approved cattery number and a code of ethics. You may say to yourself, I don’t need a show cat. That’s understandable, but what makes a show kitty different from other cats besides confirmation? It’s personality! Show Persians and their offspring, if bred correctly, should be “doggy”. They should follow you through the house, see who comes to the door. They are calm, and bred to be so. If a cat was shown in competition, they must be able to travel by car without throwing up their breakfast, handle a convention center full of strange people and noises, and have been judged or handled. A kitty that does not cooperate in the show hall, usually will remain home and at one point be eliminated from the breeding program because they will produce offspring just like themselves. How many times have you been told you’re just like your mother? The same theory belongs to line bred animals. Vanier Persians are all raised in a clean environment. They are confined with their mother from the time they are born and nurtured by their mother, a human mother is not a substitute for the real thing. They will learn to use the litter box and to love people. Their bedding and litter box is always clean, their mother is clean and no kittens have poo patties. Starting a kitten on the right track is important for clean litter box habits and eliminating feline viruses. When the kittens are 8 weeks of age, they visit Dr. Cody Bullock, DVM., at South Denton Animal Hospital. Cody will give them a kitten examination, vaccination and worming. The kittens will receive 3 vaccinations, including leukemia, prior to leaving for their new home. Persians are strictly indoor cats, no exceptions! I give an extended guarantee on your special kitty. I believe in the health of my breeding. There’s a clause in the Vanier contract to include a two year congenital defect guarantee on the heart, liver and kidneys, with full replacement if that kitten succumbs from the defect. We all want our special kitty to last many years. If the kitten starts life correctly and continues receiving vaccinations, recommended food; your kitty will live many years.